Fortunately we live in a country that gives people a chance to determine our destiny. On this page we have listed some of the things that we all can do to make our voices heard concerning the future of Van Norden Lake and wetlands. In light of the current plan of TDLT to drain the lake, we urge you to contact (preferably by email) the officials listed below if you want to preserve the lake and wetlands. UPDATE – TDLT has submitted an application for their project to drain the lake and wetlands. You can contact the senior planning person in charge directly at Nevada County by clicking here. 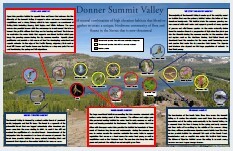 Luckily the fate of the Summit Valley is not up to Truckee Donner Land Trust alone. In this country our elected officials are responsible for overseeing the natural resources that all of us enjoy. One of the great advantages of our democratic society is that we get to contact those officials to make our voices heard to influence the decisions that are made for the common good. Listed here are the names and contact information for all of the public officials that have some sort of jurisdiction over the Summit Valley. We encourage you to contact them by whatever means and let them know that you want to preserve Van Norden Lake and Wetlands. There are many organizations dedicated to environmental preservation that many of you probably already support. 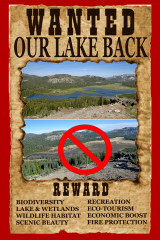 Writing to them about Van Norden Lake and Wetlands could help to enlist their support. As you many have noticed, two organizations familiar to the summit, Nature Conservancy and SYRCL, have written supporting letters for the Land Trust plan. If you believe as I do that they are misguided in this stand to remove bio-diverse habitat then contact them and let them know how you feel.